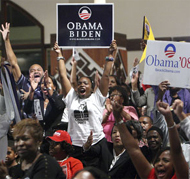 Supporters of Barack Obama celebrate at an Atlanta church November 4. • Cook Political Report: The Cook Political Report is a non-partisan, online analysis of electoral politics. On November 4, Americans elected Illinois Senator Barack Obama the 44th president of the United States.